You know, you hear a lot of people rave about how incredible a guitarist Jeff Beck is. I hear people say the same thing about Eric Clapton and (Cream and Derek and the Dominoes excepted) I just don’t get it. Well, Jeff Beck is the real deal! This guy shreds and does it without becoming noodly or overly flashy. There’s still a sense of the song ruling and a feeling of a groove to the music. This band he’s got going in this performance is incredibly good and they rip through a series of tracks that is sure to please anyone who likes hard edged guitar rock, fusion or just about anything else – that’s how good this is – it transcends boundaries. Speaking of that band, his bassist Tal Wilkenfeld looks like she’s all of sixteen years old, but plays like she’s been doing this for sixty years. Oh, and as long as we’re discussing looks, has anyone ever noticed how much Jeff Beck and Nigel Tuffnell resemble one another? Twin brothers of different mothers perhaps? We get some interesting guest appearances on this set. The first of those is Joss Stone who comes on the stage to handle the vocals on “People Get Ready.” It makes for a killer performance of this bluesy number. Next up Imogen Heap brings her unique vocal talents to “Blanket.” She returns later for “Rollin’ and Tumblin’.” The afforementioned Eric Clapton comes out to play with the group on two tracks near the end of the set. His bluesy vocals are good, but I’m still nonplussed on the guitar work. All in all this is just plain a smoking set. The videography and sound are both great and we get some cool interviews for bonus features. 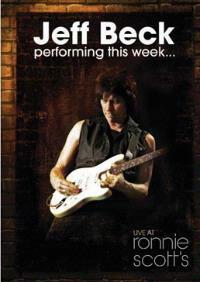 All of this makes this a must have for Jeff Beck fans, but I’d highly recommend it to any fans of great guitar.